Pasta ! I love pasta compared to rice. Pasta is such a versatile noodles that we can cook it in any style we want. When I had my operation done, I survived mostly on pasta with soup. 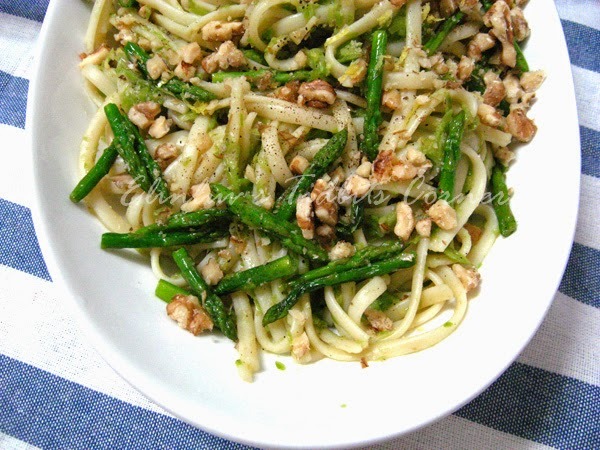 But for today, I cooked it in a simple manner with baby asparagus and walnut and lemon zest. Awesome taste and healthy too ! Love it and I can survive on pasta...slurp ! 1. Bring a large pot of water to a strong boil. Season with salt, then add pasta. Cook according to package directions for "al dente." Set aside about 1 cup cooking water, then drain pasta. 2. While water is coming to a boil, cut off and discard the tough ends of the asparagus. Cut the remainder into 1/3-inch rounds, leaving the tips intact. Heat olive oil and garlic in a large pan over medium heat for five minutes. Add asparagus, salt, pepper, and 1/3 cup of the reserved pasta water. Cover pan and cook asparagus for 4 to 8 minutes, until tender to the bite. Turn off heat and discard garlic. 3. Once pasta is done, purée 1/3 of the cooked asparagus and 1/4 cup of the reserved cooking water in a food processor, blender, or immersion blender until smooth. 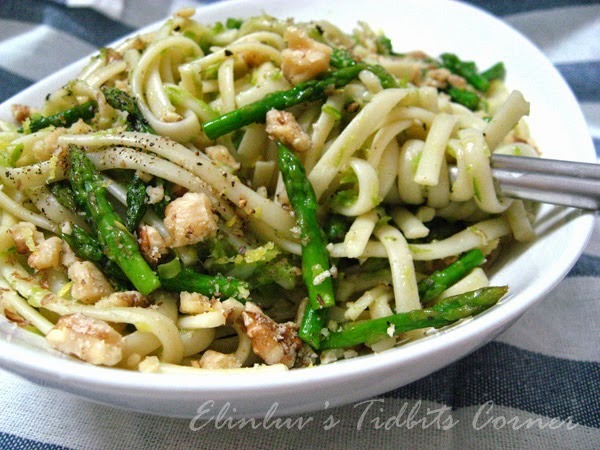 Try to avoid blending the asparagus tips, for aesthetic reasons. 4. Add puréed asparagus back to pan, along with sliced asparagus. Mix in cooked pasta, lemon zest, and more pasta water as needed to keep the sauce loose. Heat on low for a minute or two to allow pasta to absorb some of the sauce. 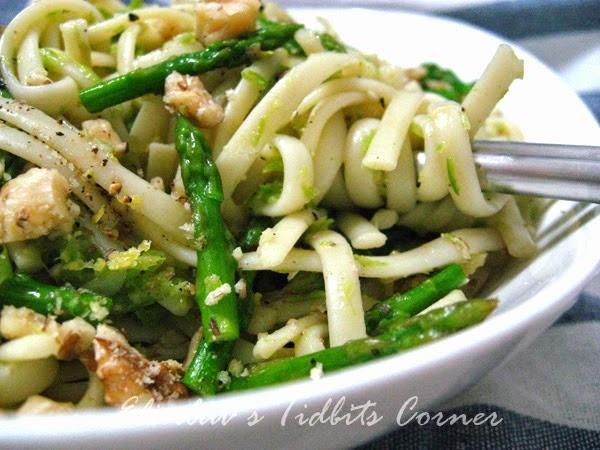 Serve immediately, topped with chopped walnuts. Pasta, rice, bread...I just love carb! This looks deeeeeeeeeeelicious, Elin.